Ron Wall and Liz Lupton from Penticton have been visiting Kaslo area on and off for years. Liz plays in the Okanagan Symphony Orchestra and together they teach violin to kids in their program called ‘fiddlekidz’. They play wonderfully together and enjoy playing for others. 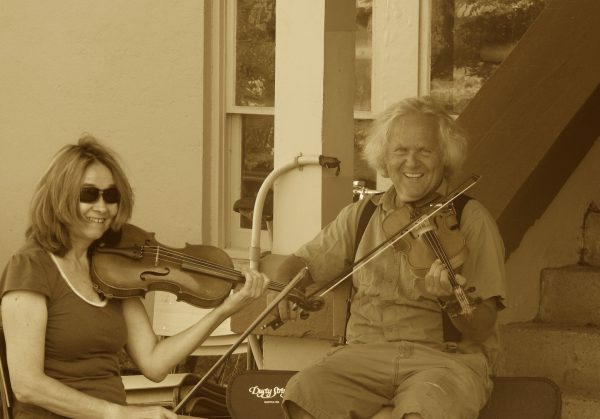 They have collaborated on a wonderful beginners fiddle book for kids and adults alike with original mountain paintings by Ron and are in the process of writing a second book. I will post some photo details about the book in the coming weeks and the book can be purchased from Mtn Fruit. We are planning to have Ron back in the fall to teach an introduction to the hammered dulcimer. As seen on the poster a few days ago in front of Mtn Fruit, local band the Lichens hosted and collaborated with the Slocan Ramblers in a small lawn concert. The sun was pushing everyone to the one corner of shade but the show went on. This is the first of a series of outdoor concerts coordinated by Mtn Fruit and Radio Free Kaslo, stay tuned for the next date and enjoy this new tune from SR written while visiting Kaslo and titled ‘Coffee Creek’! 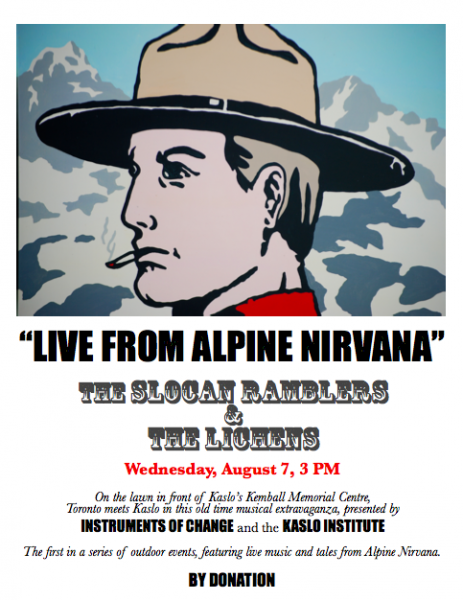 Slocan Ramblers with Lichens outdoor concert! 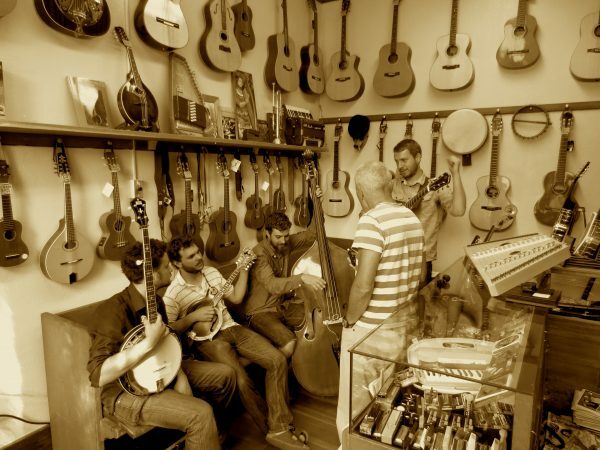 Come out and visit with the Slocan Ramblers, all the way from Toronto, and local band The Lichens. They’ll play some tunes together and apart in the noonday sun on the green, green grass of…..the Kemball Centre! Wednesday, August 7th at 3pm, see you there. 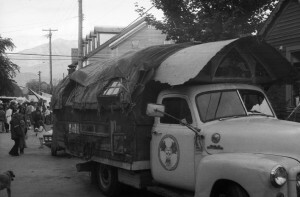 Torontos Slocan Ramblers were in Mtn Fruit for a Radio Free Kaslo interview and performed two songs. 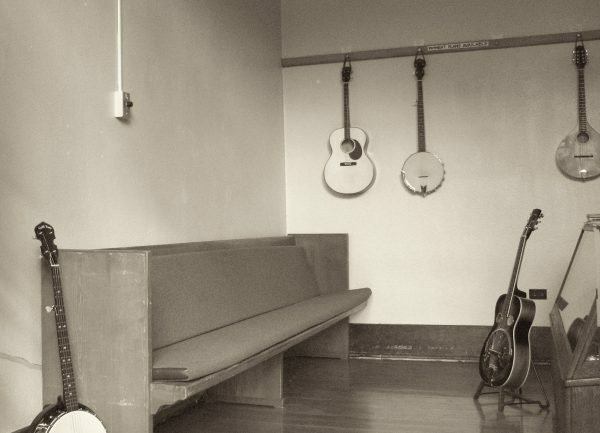 One of which was a new arrangement of an old song titled “ramblin sailor”. Magic to hear such beautiful music in such an intimate setting. These young lads make it look easy but to my ears they are all masters and real craftsmen in the musical sense of the word. Unpretentious and sensitive to the details that take take us deeper into the listening journey. Margaret, the gypsy from Israel, wandered into the store after following others to a purported ‘Rainbow Gathering’ in Meadow Creek, BC. The gathering never happened but Margaret stuck around Kaslo a few days and sang some songs for me in the shop. Her travelling guitar had been backed over by a truck while she was picking fruit in the Okanagan so I gifted her a ukelele that needed a home. She had a lovely voice and some lovely songs, made a little money busking and then moved on! But not before an interview with ‘Radio Free Kaslo’ from the pew at Mtn Fruit. These country bumpkins, Darrin Herting, Alton Gowan and John Flemming, hail from Salmon Arm, BC and put on a good ol show with lots of banter. They got some funky tenor banjos, nice harmonies and a washtub bass (aka gut bucket). Very amicable hillbillys! Go see em whenever they’re in yer neck of the woods, we hope to have em back real soon! 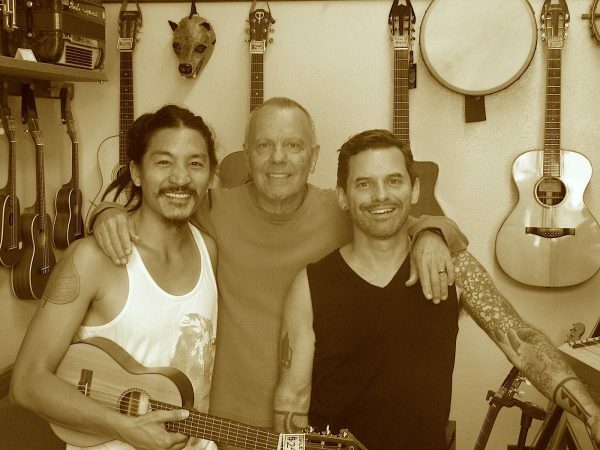 Buckman Coe and his friend Rika dropped by Mtn Fruit for a chat and some tunes yesterday. They are on a fundraising tour for the Dogwood Initiative’s efforts to stop proposed plans for the Enbridge pipeline and increased tanker traffic on BC’s coast, power to them! Rika is accompanying Buckman with his beautiful oceanscape art and together they are a very soulful team! Hope to see them again soon. In the photo, from left to right are Buckman, Randy (our intrepid Radio Free Kaslo host) and Rika. Doesn’t matter how you arrange their names, you’ve always got a band name. Mtn Fruit May Days Sale! 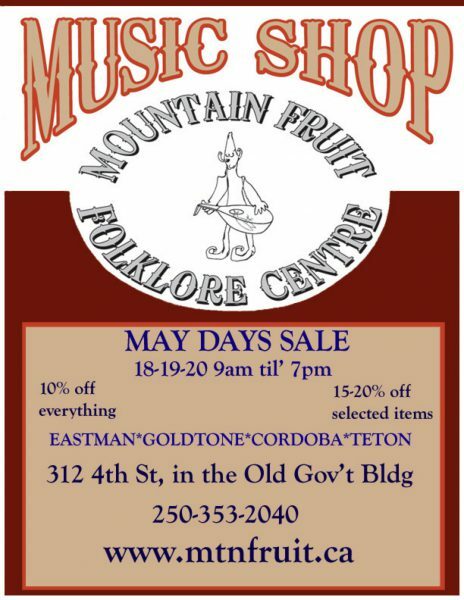 Our 2nd annual May Days Sale! How much can you afford to save? Is what my mother used to ask me when we were looking at more spending to save money, the classic paradox. Oh well, at least stop by and say hello, that’s worth plenty to us! 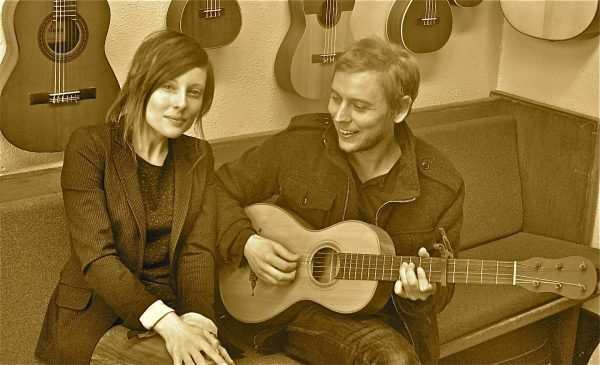 These two played a concert at the Bluebelle Bistro on Friday night that I wish I had been at. The song, The Promise, is what they sang during an interview on the Pew at MtnFruit and had me close to tears and lamenting a missed performance. Christina and Dale share a creative intimacy that is rare and beautiful. 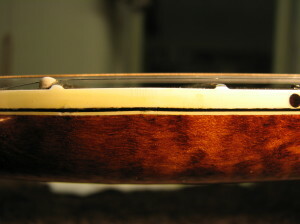 Dale Murray, an accomplished Nova Scotia musician, accompanied his wife Christina Martin on copy of a 19th Century guitar made by Jeremy Behn. I’d wish these two luck but they don’t need any, the next step is the path they’re on! We have Christinas latest CD, Sleeping With a Stranger, for purchase at the Mtn Fruit. Cellist, Michael Kevin Jones played a wonderful concert on Friday night past at the United Church as part of the Kaslo Concert Societies 2013 program. 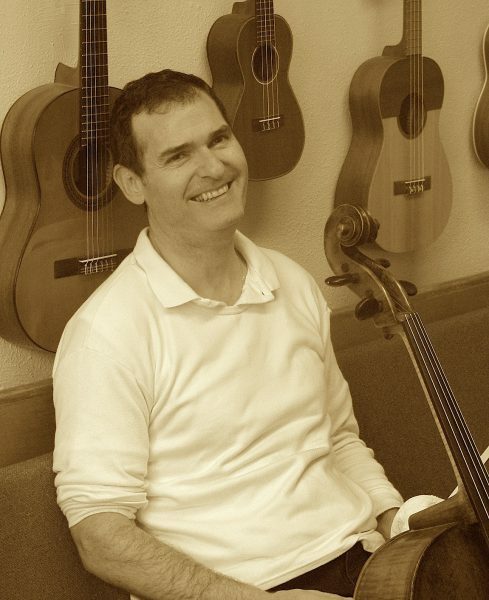 It doesn’t matter whether the program is familiar, as with his Bach solo repertoire or unfamiliar, as with the rediscovered Rodrigo solo cello piece, when someone plays with the emotional intensity and skill that Michael does one can’t help but be transported into another world called the beautiful present. I have seen Jeff play a few times now and he really has a unique sound. Certainly rhythm features prominent in his all original songs but it’s such an intense, strong, driving rhythm that nods back to his metal roots. Combined with his raspy, dreamlike vocals he gets you into a trance like state, like listening to good electronica played live on an acoustic guitar. Jeff bought a hammered dulcimer by Dusty Strings on this visit to Mtn Fruit and I can’t wait to hear how he incorporates it into his music! Cara is the first musician to be officially interviewed live ‘from the pew’ at Mtn Fruit by Randy Morse of Radio Free Kaslo. I don’t work as a travelling musician but I can safely say from meeting, watching and listening to Cara that she is the consummate professional. She works tirelessly on every aspect of her career as a singer/songwriter. It’s easy to tell she loves what she does and it’s humbling to see how much energy she devotes to her passion. She played a fantastic and lively rendition of ‘The Cockney and the Ploughboy’ for us and we look forward to having Cara back in Kaslo soon! You can purchase Cara’s latest CD, Darlingford, at the Mtn Fruit. 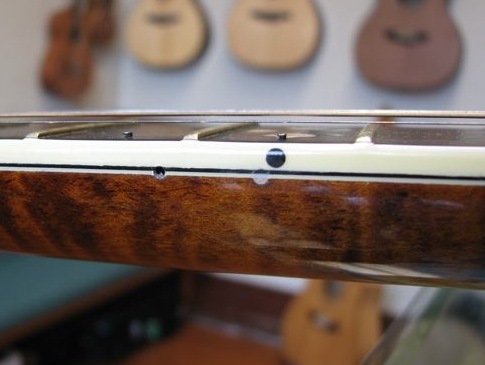 Classical guitarist Daniel Bolshoy visited the shop briefly after playing a concert the night before with Jasper Woods at the Kaslo United Church. This unforgettable concert was intense, beautiful and humorous. Their concert and several others per year of this calibre are arranged by the Kaslo Concert Society. Rumour has it that Daniel will be visiting in the summer for a masterclass teaching workshop, stay tuned! On January 30th,TMO played at the BlueBelle Bistro in Kaslo, BC. Fantastic show of the usual intimate nature. Sweet natured set of fellas, including the accordion player, who, as you can see here, is a real leprauchan. I took this photo during a visit to Mtn Fruit, in which the permanent glow of sharing their music is witnessed, as well as Ian, the accordion player, asking Kurt, the guitar player, why the rest of the band is out of focus. Leprauchan phenomena I reckon. 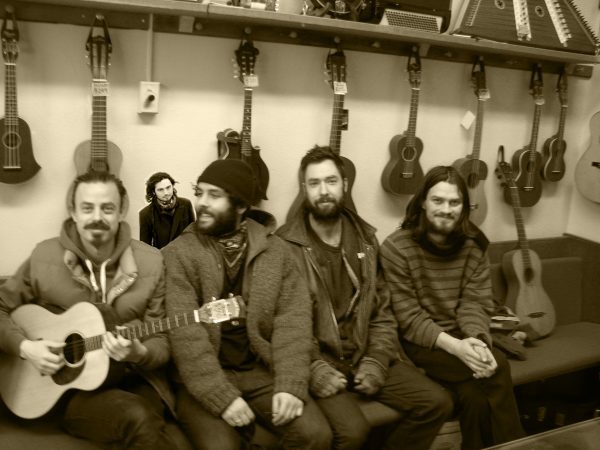 A few days after David Woodhead was in Mtn Fruit, Seattle based musician Michael Guthrie was in for a visit. Michael was instrumental in saving the Langham Theatre and ran the The Village Green cafe with his wife Dare in the 70’s. You can read a little about these endeavours on Michaels website. Michael remembered taking a bass lesson with David Woodhead and the ‘Island’ benefit concert for the Langham at the Kaslo arena. Bass player and multi-instrumentalist David Woodhead visited Mtn Fruit after his show at the Langham Theatre with James Keelaghan on Nov 1st. 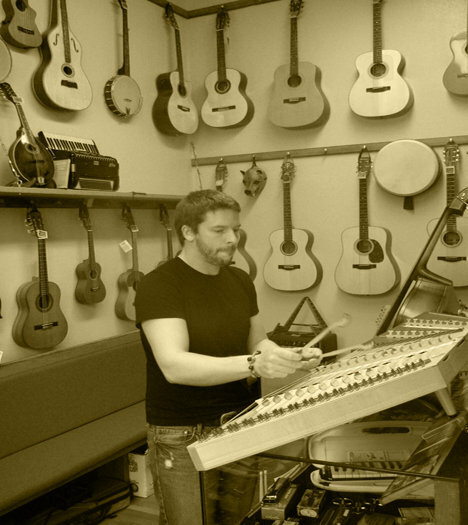 If you visit his website you will find an amazing list of musicians that David has played with. Turns out this was his first time back to Kaslo since 1978 when he played a benefit for saving the Langham in a band called ‘Island’. During his visit in 1978 he took several roles of black and white photos, some of which can be seen on Davids website. David very kindly donated a copy of all his photos to the Kootenay Lake Archives Society. Swell guy with some great stories. 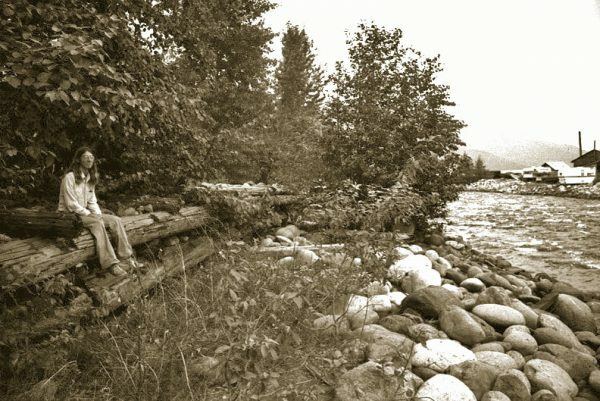 Helped enhance my limited understanding of an almost mythical time in Kaslo from my perspective. An influx of young families, Bruce Cockburn jamming at The Village Green cafe, saving the Langham and much more! 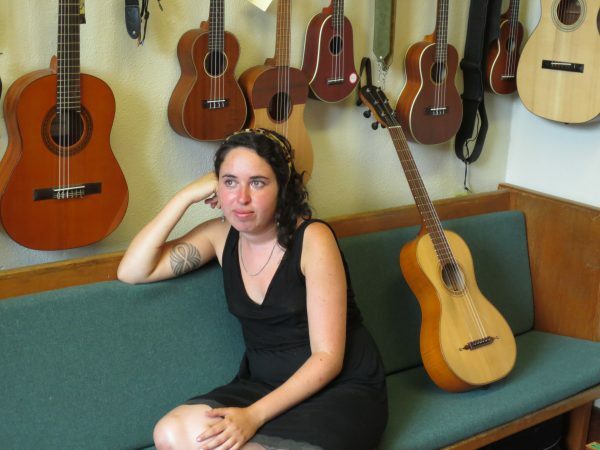 New Kootenays Music Shop opens during Kaslo Jazzfest! 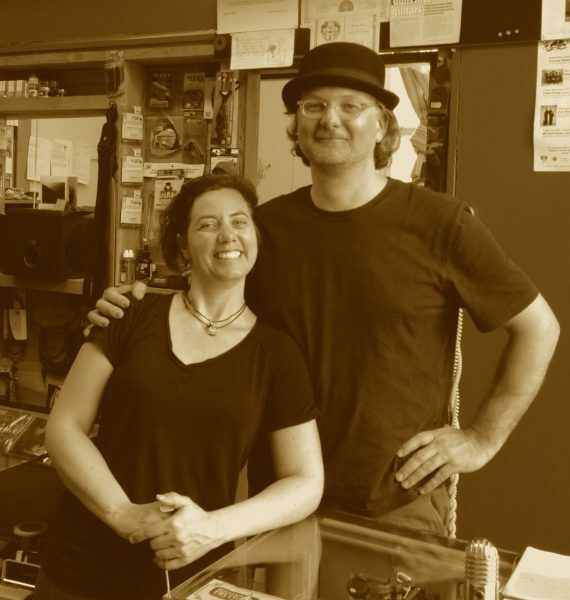 On July 29th 2011, resident Luthier Jeremy (who builds instruments under the name Instruments of Change) Behn opened Canadas smallest music shop in the ‘Old Gov’t Building’ in Kaslo, BC. 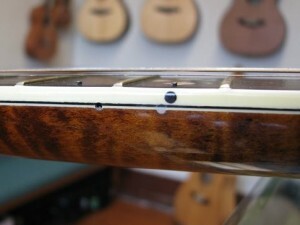 The storefront is an expansion of his stringed instrument repair business that has been active for several months now. 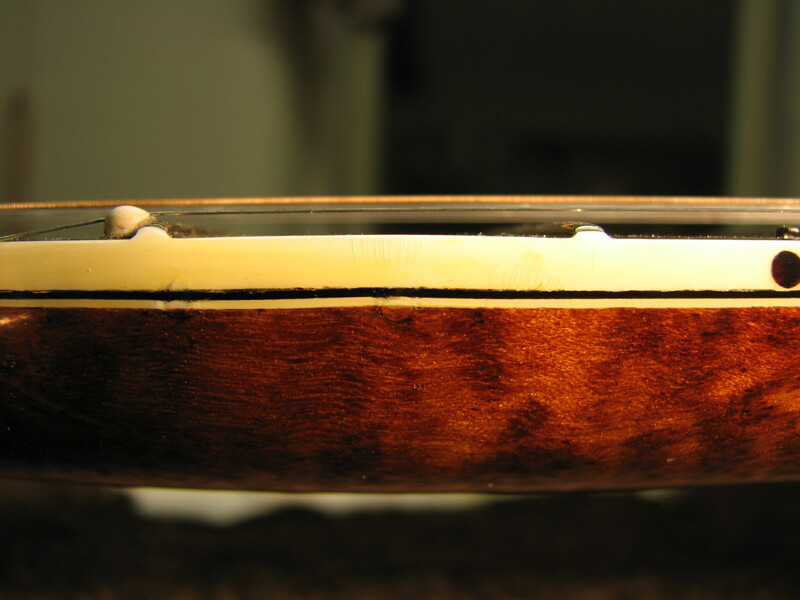 The Mtn Fruit repairs most stringed instruments including the violin family and is currently selling D’addario strings, new instruments from Goldtone and consignment instruments of all types. Heartfelt thanks to my 9 yr old son, Jordan, for contributing his elf drawing for the Mtn Fruit logo. As well, to my 5 yr old son, Chase, for helping rip up the old carpet/linoleum floor to reveal some beautiful doug fir T&G, and to my wife, family and friends for supporting this venture. Come and visit!